It’s been a very busy month. Most of the time has been spent sourcing the hard landscaping materials, in particular the polished pebbles for the cobbled path. I have quite a few samples now from different suppliers. I spoke to a renowned expert in the field, Maggy Howarth, and was given some good tips. 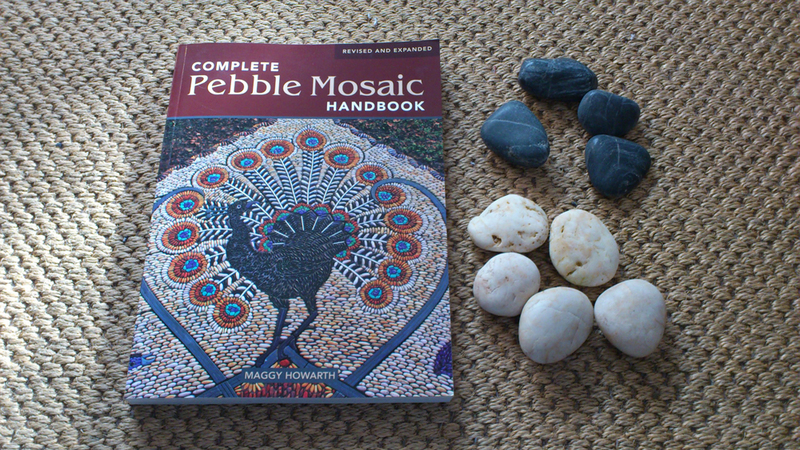 I have also added to my collection of books with a copy of the ‘Complete Pebble Mosaic Handbook’ – a great find! I am very excited to be working with Robin James, a Stroud based mosaic artist. Robin will be creating the mosaic artwork for our feature wall; she has some amazing ideas for the design, which fits very well with the travel and arts theme. I have also had a number of discussions with our landscaper, David Sewell from The Gardenmakers, about the logistics of the build. The cobbled path will be built in pre-cast panels which will then be fitted together during the build phase, this will be our biggest challenge! Next month we get to visit the showground and will see our plot, so very excited about that. We should also see some of the plants arrive at the nursery, the two trees (Elaeagnus angustifolia) are coming from Italy so can’t wait to see these.